When Steve Jobs died in 2011, his authorized biography was rushed to press, quickly followed by the low-budget, independent film, “Jobs.” Fans of the Apple CEO had to wait until last October for the full Hollywood production, “Steve Jobs,” featuring an A-list cast and team, to reach the big screen. Audiences were disappointed in the film because it bombed at the box office. Expectations surely were for a depiction of Jobs’ stellar technology and business achievements. But the truth is: this movie is more about its heroines than its hero. For her performance in “Steve Jobs,” Kate Winslet won the 2016 Golden Globe for Best Supporting Actress and was nominated for an Oscar this year as well. She plays Joanna Hoffman, long-time marketing chief at Apple and “right-hand woman” to its co-founder. Known as the one person who could stand up to the difficult and temperamental Jobs, in the film Hoffman calls herself his “work wife.” Winslet, as Joanna, is the moral center of the movie. “Steve Jobs” was lucky to get made. It was originally produced by Sony Pictures, but after North Korea hacked its computers in late 2014, divulging embarrassing executive emails, Universal Pictures acquired the film. A who’s who of actors and actresses were considered for parts. Oscar-winning director, Danny Boyle, chose Matthew Fassbender — despite looking nothing like Jobs — for the title role (he was nominated for the Best Actor Academy Award). Jobs’ widow, Laurene Powell-Jobs, encouraged Isaacson to write his book, but her eventual dissatisfaction with it, as a less-than-flattering portrait of her husband, led her to reportedly block the film’s production. However, there may have been a more underlying reason. In 1978, Jobs fathered a daughter, Lisa, with girlfriend Chrisann Brennan, and for years denied paternity. Chrisann lived on welfare with Lisa and cleaned houses; though a court ordered the multi-millionaire Jobs to pay child support, they continued to suffer financial hardship. Years later, Jobs would acknowledge Lisa and attempt to reconcile with her. Chrisann wrote that Jobs “apologized many times over for his behavior” to her and Lisa and “said that he never took responsibility when he should have, and that he was sorry.” Jobs’ sister, author Mona Simpson, is credited with repairing the relationship between Lisa and her father, though Jobs’ relationship with Chrisann remained contentious throughout his life. Prior to penning “Steve Jobs,” Sorkin talked candidly at length with Lisa Brennan-Jobs, and despite the rich biographical material in Isaacson’s book, including dozens of interviews with Jobs, he decided to make Lisa the core of his screenplay. Sorkin augmented Isaacson’s research with new insights from Lisa (who had not wanted to be interviewed by Isaacson because her father was then still alive). The film is essentially a three-act play (interspersed with flashbacks), each act focusing on backstage scenes before a major product introduction, and Lisa figures centrally in each – as does Hoffman. Sorkin later said that getting to know Lisa, and having a young daughter of his own, led him to focus “Steve Jobs” on a theme deeper than technology or “changing the world.” He implied the key to understanding Jobs the man was his process of growth to fully embrace Lisa. Boyle and Sorkin’s “Steve Jobs” rearranges many of the facts about Jobs and Apple for dramatic effect, clueing audiences this is not a biopic, but almost a morality tale. Winslet’s best scenes are when she engages Jobs one-on-one before he goes on stage for a product unveiling. In Act I, Chrisann and five-year-old Lisa, come to Jobs’ backstage dressing room before the 1984 unveiling of the original Mac to ask him for financial support. They depart dissatisfied, as Jobs again denies paternity. When alone with Steve, Joanna pleads, “You must be able to see that she looks like you.” Steve ignores her. “I know you heard what I said,” she shouts. Jobs then insists it’s statistically almost impossible he’s Lisa’s father, but just the same, he’s going to give Chrisann money and buy them a house. Joanna retorts: “There’s a small girl who believes you’re her father, that’s all, that’s all the math there is. She believes it. What are you going to do about that?” At which point, Steve mutters “Gimme a break,” and rushes out the dressing room. Act II occurs after Jobs was fired from Apple, at the 1988 introduction of his ill-fated NeXT computer. In his dressing room, Jobs finds Lisa, who’s come to be at her dad’s product launch. She’s examining the NeXT cube computer with a ruler, and Steve discovers she has a keen sense of design for a fourth grader. Then, in a backstage chat with Lisa, she bends over backward for his attention, engaging him about things she’s interested in. Although Steve insists she should be in school that day, she puts her arms around her father’s waist and hugs him, as Joanna gazes intently at them. His relationship with Lisa has grown, despite continued friction with Chrisann. The official trailer for “Steve Jobs” (courtesy Universal Pictures). Teenage Lisa reappears in Act III, and the film concludes in a powerful closing scene with Steve, Joanna and Lisa, which, though deviating from historical fact, is filled with emotional truth. Hollywood often portrays larger-than-life figures. In “Steve Jobs,” Boyle and Sorkin utilize two women, in supporting roles, to tell a story of how the most “successful” in society, in this case an American icon, often miss recognizing what is truly important and right in front of their noses. “Steve Jobs,” rated R, is available digitally (iTunes, Google Play, Amazon Video), on DVD and Blu-ray, and on demand (cable); running time: 122 minutes. Directed by Danny Boyle; screenplay by Aaron Sorkin. Main cast: Matthew Fassbender (Steve Jobs), Kate Winslet (Joanna Hoffman), Seth Rogen (Steve Wozniak), and Jeff Daniels (John Scully). See IMDB for full film details. Sorkin’s shooting script for “Steve Jobs” was posted by Universal, although a few scenes were cut by the director, and some dialogue differs slightly from the screenplay. 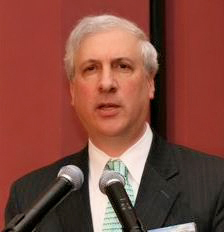 Dr. Mark P. Barry is Managing Editor of the Applied Unificationism blog and Lecturer in Management at UTS. 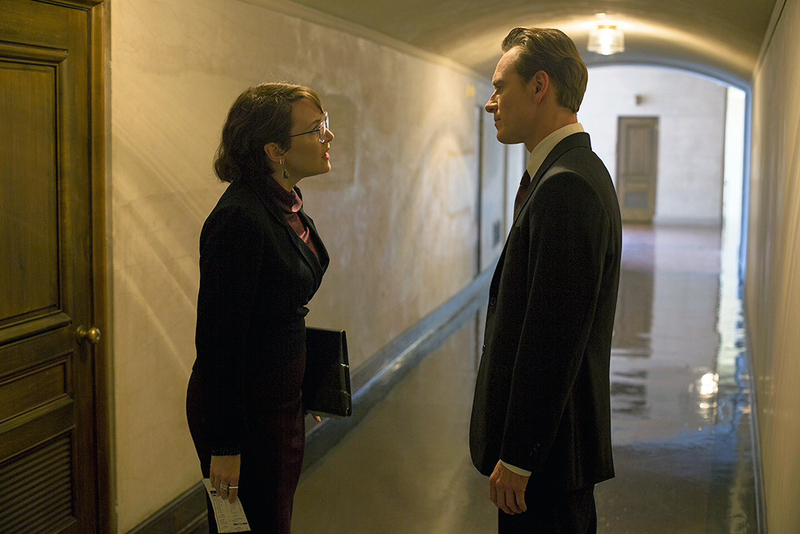 Photo at top: Kate Winslet and Matthew Fassbender in a scene from “Steve Jobs” (courtesy Universal Pictures). This is an interesting review of “Steve Jobs,” especially Mark’s insight into the role of women in his life. I was disappointed by the movie as I thought that it didn’t give a rounded view of Jobs. I also watched an interview with Steve Jobs on Netflix and was impressed with his demeanor and the answers he gave in the interview. He came across as thoughtful, charismatic and humorous. I know that he had been on a spiritual quest at one time in his life and I think that he was a practicing Buddhist. I don’t think money was ever his goal in life but to create excellent products that people could enjoy. He attracted like-minded people in the early stages but Apple lost its way somewhat as it became more successful.